The Bordentown Regional Middle School’s seventh-grade class traveled to the New Jersey School of Conservation for a three-day trip full of environmental discovery. Chris O’Leary of Bordentown Middle School working together with Lisa Mills, Program Coordinator, here at the School of Conservation, planned a fun-filled excursion for the seventh graders. The kids got to experience a large variety of classes including Action Socialization Experience (ASEs), Archery, Herpetology, Boating, Confidence Course, Survival, Conservation Photography, and the Climbing Wall. Students began their School of Conservation experience with team-building exercises at Action Socialization Experiences. ASEs involve a variety of challenges set forth for groups to promote the use of effective communication, listening, planning, leadership, and innovative problem-solving. The groups found that working together can be difficult, but when done effectively, it allowed them to solve challenges they would not have been able to complete alone. Everyone came together at the end of the activities to discuss what they learned and the way these skills could transfer to everyday life. The group also had an opportunity to participate in archery here at the SOC. 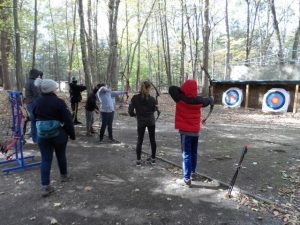 The seventh graders learned safe and proper archery techniques and then got the chance to test out their skills. Emphasis is placed on precision in shooting, and as the class progressed, students were encouraged to keep track of and improve their scores. Bordentown’s seventh graders learned about slimy and scaly friends in herpetology, where reptiles and amphibians and distinguishing characteristics were discussed. The students then got to meet the live educational animals working here at the NJSOC—Picta the painted turtle, Mohammed Ali the box turtle, and Cornelia and Elaphe resident corn snakes—for an up-close look at adaptations that reptiles possess that make them contenders in the natural world. Students finished out the class by going out on the SOC campus to see if they could find any herptiles in the wild. The seventh graders headed down to Lake Wapalanne to try out the canoes and rowboats. They got the chance to learn some boating techniques, as well as seeing the SOC campus from a different point of view. They were even able to test out their new-found skills with a rousing game of boating tag. Fun was had by all! Confidence was the name of the game when the group moved on to two other elements. Both elements encourage students to get out of their comfort zone and are focused on building strength through positive words of classmates. At the confidence course, students channeled their inner tightrope walker on the low ropes course. With a large variety of elements, this activity required balance, teamwork, and a can-do attitude. The climbing wall took the students off the ground and allowed them to reach new heights. The seventh graders were able to try out both the 20- and 35-foot climbing walls and did an excellent job encouraging each other while they climbed. Students used the time outdoors to become familiar with survival strategies and skills. Survival class began with a discussion of different potential life-threatening situations they could find themselves in. The class then learned the four basic needs (air, shelter, water, and food), as well as what to do if they were to find themselves in a survival situation. They then moved deeper into the forest to discuss what supplies might be most useful to them. Finally, they got a chance to practice building effective shelters and discussed what makes a good survival shelter and why. In a world where pictures have become so commonplace, it’s easy to forget how useful and meaningful photography can be. In Conservation Photography, the Bordentown students were able to step behind the camera and get some truly magnificent shots of the School of Conservation campus. A discussion of techniques that photographers use to create an interesting shot was followed by a hike through various environments here at the SOC and students were encouraged to capture the natural beauty around them. They then were able to print one of their pictures to bring home with them as a memory of a fantastic trip. All the environmental educators and staff here at the School of Conservation would like to thank Bordentown Regional Middle School for an amazing trip. We hope to see you all again next fall!